When you think of a breakfast scramble you probably think of eggs; unless you are Vegan then your thoughts quickly switch over to the scramble you can have…Tofu. For this week’s Face Off we decided to try our hand at breakfast scrambles – two unique breakfast options with simple, yet interchangeable, ingredients. 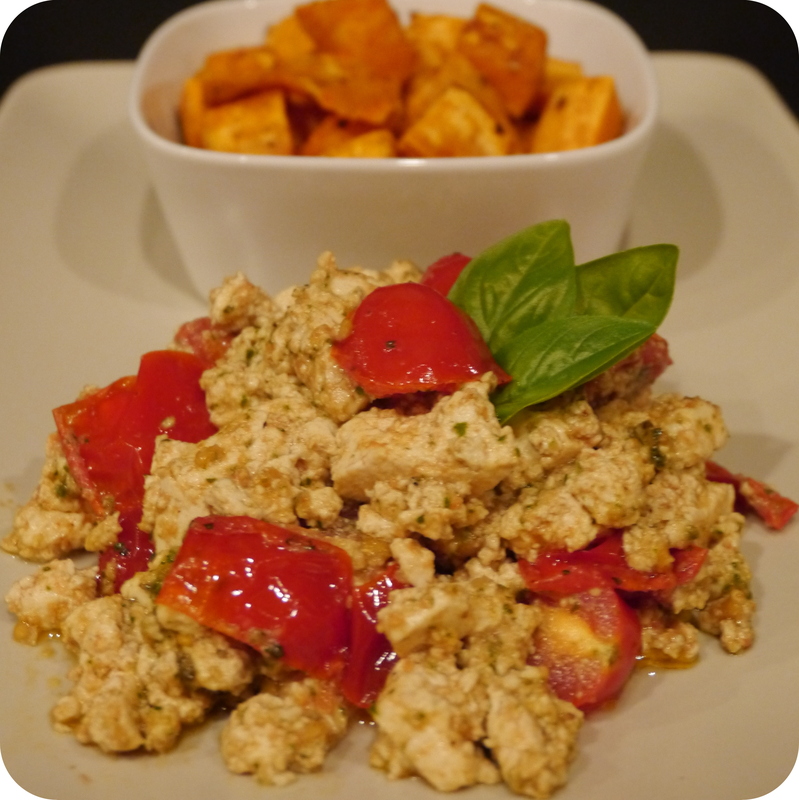 My Tofu Scramble is comprised of very simple ingredients, but bold flavor. Pesto is really the star of my dish covering the tofu and tomatoes with all of the herbs and spices you need. Super easy and super yummy…it was difficult for me to not eat the entire brick of tofu in one sitting. For the non-Vegan’s, try your eggs with pesto and tomatoes, you won’t be disappointed. 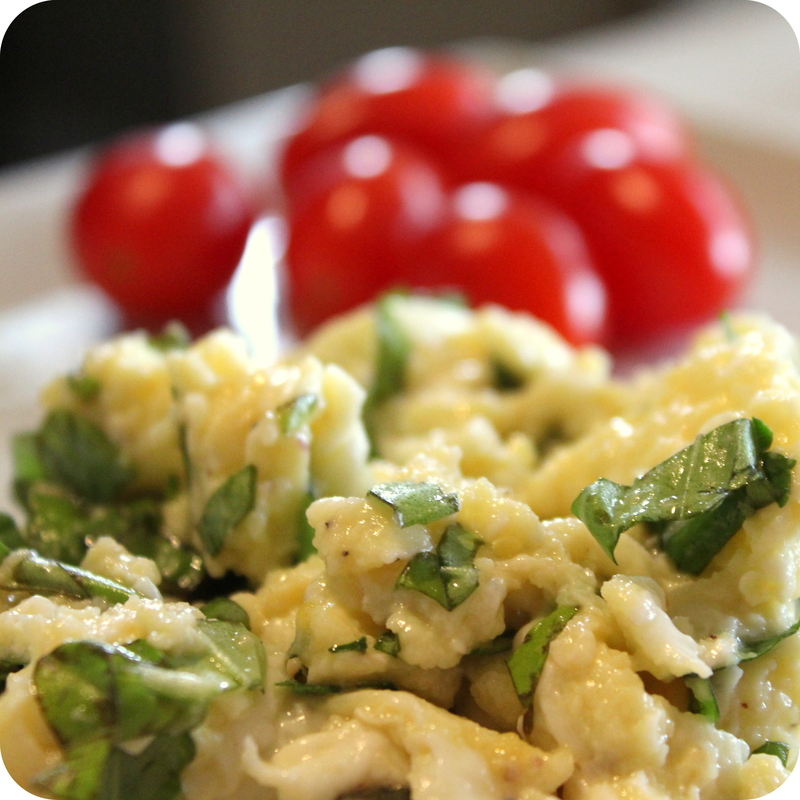 Morgan’s Egg Scramble features her herb garden with a mixture of basil, parsley, thyme and marjoram and adds a touch of creaminess with butter and milk. You can’t go wrong with fresh herbs in any dish. For the Vegans, chop up a mixture of fresh herbs and stir it into your tofu, try making it creamy with Vegan butter and soy creamer, yum! Here you have it – Breakfast Scrambles for both your Vegan and Not-So-Vegan family, friends, guests, co-workers, roommates, acquaintances, colleagues, buddies, companions, partners, etc.